Days after undergoing treatment for severe burns, Darci Miller headed to the Indianapolis Zoo with her fiance, Jason Costello, looking for a distraction. Luckily, a 12-year-old orangutan named Rocky happened to find her. The ape stared as the visitor from Greencastle, Indiana, roamed around his exhibit. 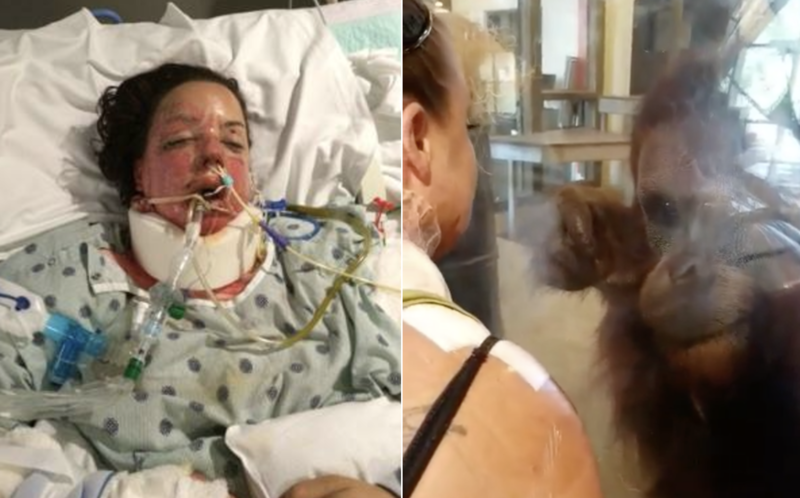 Miller was burned by gas fumes while doing yard work in May 2015, and her arms and chest were covered in bandages after receiving treatment at a nearby burn treatment center. "He left the group he was with interacting with and came over to a secluded window," Miller told CBS News. "We went over to that window and he immediately wanted to see everything I had going on." The curious ape closely examined Miller's neck. He would lean back and then get close to the glass in order to get a better look. "He wants you to show him," Costello said as he taped the incredible interaction. "That's crazy. He wants to see it." Rocky pointed as Miller peeled back her bandages to show off her healing wounds. "Is this normal?" she asked. "Yeah, this is normal for Rocky," a zookeeper standing nearby replied. The pair studied each other for 20 minutes before Costello started recording the interaction. A crowd gathered behind Miller, gasping as they watched the ape's every move. "He was pointing at everything," Miller said. "I was told he doesn't know sign language, but in my opinion it was clear he knew something. He was engulfed in everything I had going on." It had to be a fluke, Miller thought. She left the exhibit, determined to pay Rocky one last visit before she left -- just to be sure. Sure enough, as soon as she returned Rocky met her at the window. Internet users agreed. The video has garnered nearly 2.5 million views since it was posted on July 26. But the zoo wasn't entirely surprised by Rocky's behavior. "Our orangutans eagerly interact and communicate with people they know well, such as their caregivers," the zoo said in a statement. "Rocky is a bit different. He regularly interacts with people he may not know. The exchange in the video is a great example of this." Zookeepers aren't sure what exactly was running through his mind at the time, but they can tell he was trying to communicate. "His behavior demonstrates strong interest and concern," the zoo added. "There is no doubt that this was an important interaction for him, and his gestures to the woman clearly communicate that."